This was the last opportunity the world had to rid itself of imperialism. But well, Marathas lost and there is no point cribbing over past. 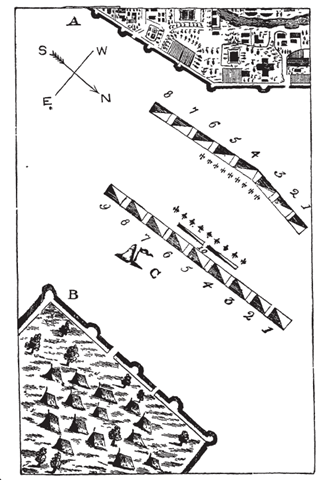 Below is the field layout for the Battle of Panipat where the Marathas were routed militarily and they lost a generation of administrators which crippled them forever, most important being Viswas Rao, the heir of Peshwa, Bhau, the Peshwa’s Prime Minister and brother, Shamsher Bahadur, another of Peshwa’s brother, Antaji Mankeshwar, Governor of Delhi, Jankoji Shinde, head of Shinde Clan, Tukoji Shinde, Regent of the Shindes, Yeswant Rao Powar, King of Dhar and the Prime Minister of the Holkar. And yes, they acted like village warriors where everyone in the village will try to be in the thick of the fight, not as field commanders. It doesn’t make any sense at all for Yeswant Rao Powar to climb on the elephant of Atai Khan to kill him, neither does it make sense that Santaji Wagh’s body had more than forty mortal wounds nor is the fact that there were twenty Afghan dead near the body of Bhau – they are supposed to plan and lead the armies, not fight like common soldiers. 4. THE BHAO SAHEB AND THE KHAS PAGA. The distance between the two camps was approximately 8 miles. 2. AMIR BEG AND THE MOGHALS. 10. CAMEL GUNS AND PERSIAN SHARPSHOOTERS (SKIRMISHING LINE). Marathas-55,000 cavalry, 15,000 infantry, 15,000 Pindaris. Total, 85,000. But the number, including camp-followers, was nearly 300,000, of whom two-thirds perished. .
Afghans.-41,800 cavalry, 38,000 infantry, total 79,800, with perhaps four times as many camp-followers. However, we need to note that at least 50,000 of the camp followers were better horsemen and soldiers than the Pindaris who are counted in the army. This in itself will give an overwhelming advantage to the Afghans in numbers and may tell us why Bhau dillydallied for almost four months before coming in open – he was facing an army double that of his and his brother was busy partying in Deccan instead of coming to his help.